With a stay at World Tour Golf Resort in Myrtle Beach, you'll be within a 10-minute drive of Myrtle Waves and Tanger Outlet Center. This golf hotel is 5.5 mi (8.9 km) from Family Kingdom Amusement Park and 5.7 mi (9.2 km) from Ripley's Aquarium. Make yourself at home in one of the 40 individually decorated guestrooms, featuring kitchens with refrigerators and microwaves. Rooms have private balconies or patios. Conveniences include separate sitting areas and coffee/tea makers, as well as phones with free local calls. While the golfer in the family is out on the course, try one of the other recreational amenities offered, such as an outdoor pool. Additional features at this hotel include complimentary wireless Internet access and barbecue grills. At World Tour Golf Resort, enjoy a satisfying meal at the restaurant. Quench your thirst with your favorite drink at the bar/lounge. 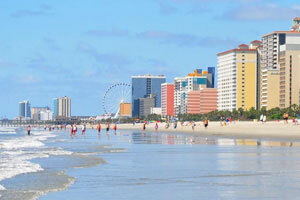 The preferred airport for World Tour Golf Resort is Myrtle Beach, SC (MYR). Parking of motorcycles, campers, boats, trailers, or commercial vehicles is strictly prohibited.